Everything you’ve ever wanted to know about the epic zero waste alternative to tampons and disposable pads – the menstrual cup. Every month, nearly half of the world’s population experiences up to 7 days of pain, cramps, crankiness, and bleeding. Yes, period, we’re talking about you. 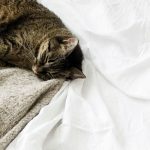 To deal with this uncomfortable situation, women flock to the drugstore, snatching overpriced cotton products by the box-load – but what do we really know about mainstream feminine hygiene products? It’s widely known that nearly all conventional tampons are made from cotton that is heavily sprayed with pesticides and therefore includes glyphosates and bleached cotton which can lead to trace amounts of dioxins. Both of these chemicals can cause reproductive and developmental problems and are potentially carcinogenic. To make conventional tampons even more questionable, the FDA has categorized tampons as medical devices which means that producers are under no duty to disclose their ingredients. Similar studies conducted on conventional pads and pantyliners yielded similar results. Beyond health concerns though, disposable feminine hygiene products are major contributors to landfill waste. 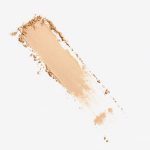 Between the plastic applicators and non-biodegradable materials used for wrappers and liners and the pesticide heavy, water hungry cotton used to make each individual tampon or pad, these products are bad for the environment. Ladies, meet your new best friend: the menstrual cup. Menstrual cups are designed to catch menstrual blood in a bell-shaped cup with a stem that is inserted, like a tampon. They are usually made of flexible medical grade silicone and are eco-friendly as they don’t create monthly waste which makes them a great alternative to tampons and pads that is better for the environment. They are also better for your body because they are made from safe materials, avoiding chemical-laden cotton and prevent the risk of Toxic Shock Syndrome. Some women have reported that menstrual cups help alleviate cramps and are odor free (fun fact, smells are caused by the odor-causing character of cotton and paper-based products). Cups can also be used for up to 12 hours at a time which means you can wear them comfortably while out and about, at the office or overnight. Voted the best menstrual cup for first-time users, the Lena Cup is one of the most affordable menstrual cups on the market. Constructed from medical-grade silicon, made in the USA, and FDA-approved, Lena Cup’s flexible design ensures both comfort and leak-free peace of mind for up to 12 hours. It’s suitable for all bodies types and even works for intense sports. 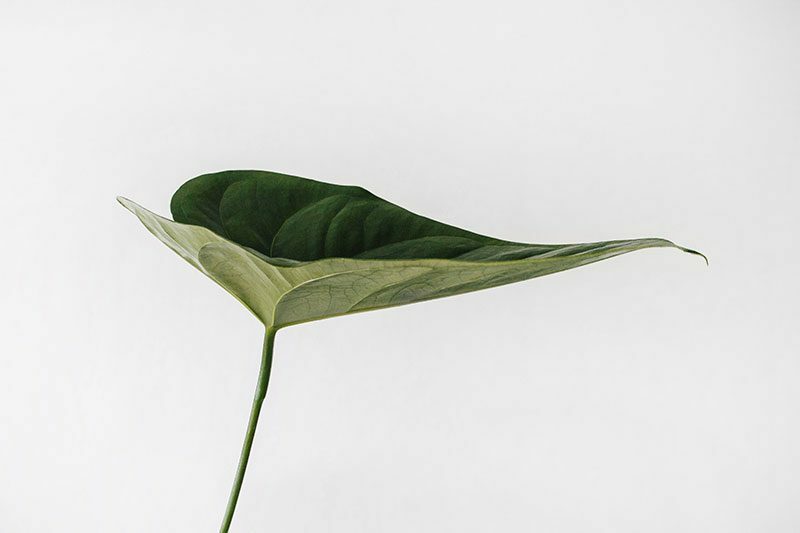 Lena Cup is committed to reducing their environmental impact and in addition to being a reusable long-lasting product, their packaging is made from 100% recycled materials and printed with vegetable-based inks. Many first time users rave about the Lena Cup, even going so far as to say it’s changed their lives and that they’ll never go back to conventional feminine care products. Some users have also stated that Lena Cup is best for heavy flows and that it offers adequate protection without any leaks. If you’re looking for one of the best menstrual cups when making the switch, then the Lena Cup deserves serious consideration. For every cup purchased, Ruby Cup donates menstrual a cup to a girl or woman in East Africa, Nepal, Ghana who lacks access to menstrual care products. The Ruby Cup is made from 100% medical-grade silicone and is free from plastics, latex, toxins, and bleaches. Each cup comes in an organic cotton bag for storage and is registered with the Vegan Society. The Ruby Cup menstrual cups can be reused for up to 10 years which means you’re basically getting a 95% return on your investment. If you’re unsure about whether a menstrual cup is the right choice for you, Ruby Cup offer a no questions asked money-back guarantee which means you can switch size or get a full refund within 4 months of order date – even for cups that have been used. This extra peace of mind (particularly if this is your first cup) goes a very long way to making this one of the best menstrual cup options if you’re still on the fence about trying one out. If you’re looking for the best-known menstrual cup you’re almost certainly going to end up finding a DivaCup at the end of your search. As one of longest-established and best menstrual cups on the market today, the DivaCup is the sole cup to receive the coveted ISO certification for medical devices. DivaCup was the first company to sell menstrual cups and has since become the industry leader, gathering a long list of awards and major publication features along the way. Regarded as a pioneer in the market, DivaCup is made from high quality, food grade silicone and has no plastic, latex, PVC, oil, acrylate, BPA, phthalate, elastomer, or polyethylene, and is free from colors and dyes. It’s received approval by the FDA, the Australian TGA, and was the first cup to be sold in Canada. DivaCup is also the first menstrual cup to receive Medical Device Single Audit Program Certification. Available in two sizes, the DivaCup is extra-durable with an easy-grip removal stem. 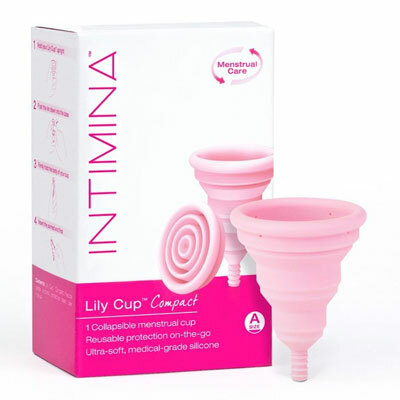 The Intimina Lily Cup is unique as it allows users to collapse the menstrual cup flat for the ultimate in discretion. The cup itself is soft and flexible, making it easy to use and many women reported that they barely felt it. On the other hand, some users complained that the collapsible nature of the cup made it harder to get it securely in place. The Intimina Lily cup is made from medical grade silicone, is hypoallergenic, and free from BPA, phthalates, dyes, and bleaches – all of which are considerations to be thinking about when choosing the best menstrual cup for you. Lunette Cup is a Finnish brand that’s been around for more than ten years. It’s received the coveted Key Flag Emblem which designates products that are considered to be top notch in their field. Th Lunette menstrual cup has also been accepted by the FDA, Australian Standards Association and the Finnish Standards Association (which must adhere to EU regulation). The Lunette Cup itself is made from FDA-approved silicon and is both hypoallergenic and toxin free. Materials used in the creation of the cup are all-natural and free from dioxins, bleach, and antimicrobials. The cup comes in two different sizes and users tend to enjoy the easy-to-use removal stem. Its capacity is on par with a super plus tampon, although it can stay in place for up to 12 hours. 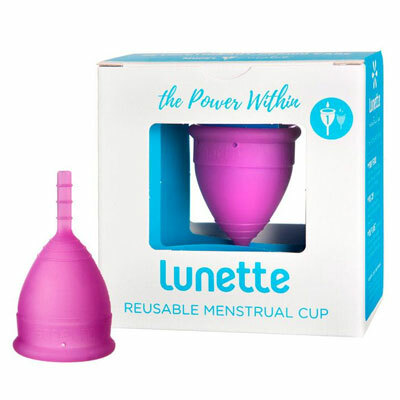 To ensure optimal hygiene and efficiency, the Lunette menstrual cup should be replaced every 3 years. While most cups are made from rubber or silicone, MeLuna is the only menstrual cup available that’s made from TPE (thermoplastic elastomer), a material that’s widely used in the medical market. Benefits of TPE include fewer allergic reactions, a smooth texture that doesn’t dry out easily, and the ability to regain its original shape after being boiled. Produced in Germany, MeLuna is one of the best menstrual cups having received FDA-approval and being the only brand that offers an assortment of firmness options: classic, a good all-purpose firmness; sport, the firmest cup on the market; and soft, ideal for sensitive women and expert-cup users. 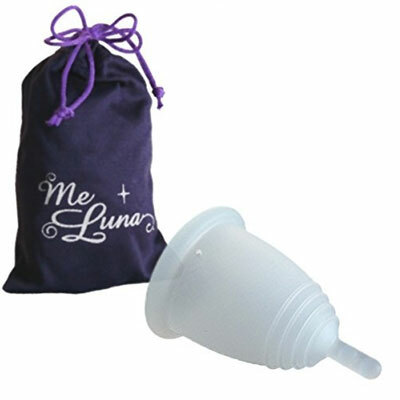 The MeLuna menstrual cup comes in 8 different sizes and offers three different stem options, including a classic stem, a ring, and a ball. Unlike many other brands, the Dutchess Cup comes in a set of two – one for keeping in the house and one for your handbag, so you’re always prepared. Designed in the USA and made in China, the Dutchess Cup is a menstrual cup made from medical-grade silicone which is free from phthalates, latex, dioxins, and BPA. The set includes one pink cup and one purple cup, both of which are designed with a removal stem and an easy-to-clean ridge-free body. Since the Dutchess Cup is smaller than other menstrual cups on the market, it’s ideal for women who haven’t given birth or who are sensitive or narrow. Depending on your daily routine, the smaller size might prove to be a bit awkward as it’s recommended to empty the cup 2-5 times a day, so keep this in mind before buying. At about half the price of other menstrual cups out there, The Blossom Cup is one of the most affordable menstrual cups currently available. Made in the USA from FDA-approved, BPA-free silicone that’s been imported from Germany, this cup comes in two sizes with the larger ideal for women who’ve had children. It comes with a satin storage pouch and is available in three colors: blue, pink, and purple. The cup’s holding capacity is 20ml which is smaller than the standard 30ml so it will require more frequent emptying. Some users found the Blossom Cup’s design to be on the longer side which might not be ideal for some women, but if you’re looking for the best menstrual cup when it comes to overall user feedback, then the Blossom is a great choice. Athena Cup is one of the newer menstrual cups on the market and since launching in 2017, has already received many favorable reviews. In many ways, the Athena Cup is comparable to the Dutchess Cup. Both are made in China from BPA-free FDA approved food grade silicone and are similar in size and cost. Available in two different sizes, this menstrual cup skews towards the small end and is more compact than some other cups. This is great for women looking for a petite range of menstrual cups or who have a light flow. The Pixie Cup is another relatively new brand, launching in 2016. It’s received mixed reviews – it has a longer stem than most menstrual cups which makes it easier to remove but can cause discomfort for some women. Some have found the cup to be too soft, saying it’s prone to leaks, while others prefer a softer cup. While the business is located in the USA it’s unclear where the product itself is manufactured. 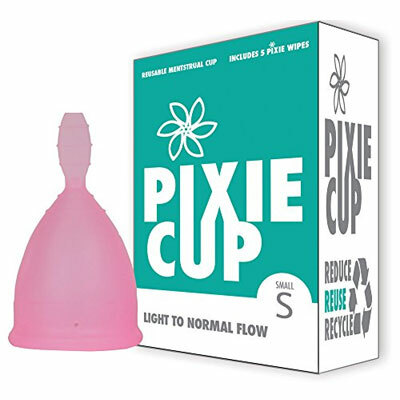 Nonethless, Pixie Cup is made from FDA-approved medical grade silicone. It is smaller than some menstrual cups and sizing is based on flow, rather than the standard metrics of whether a woman has had children or not. Menstrual cups may at first glance appear daunting but after getting used to it, most women say their periods are significantly improved. Many companies offer two sizes, one for women who haven’t had children and one for those who’ve given birth, so selecting the best one for your body is pretty straightforward. Once the menstrual cup is in place give the base of it a gentle twist to make sure there’s enough suction to keep it where it should be. If you want to check that the cup is securely in place do a few squats, if it moves about remove the cup and try again. Like with tampons, the menstrual cup should feel comfortable and it should pretty non-existent when in place. If it feels uncomfortable at all, remove and re-insert. If in place properly, cups shouldn’t leak. When it’s time to empty, give your hands a good wash and then remove the cup in the bathroom or shower. Sitting on the toilet or squatting in the shower help. Make sure your muscles are relaxed and then give the stem a good tug. Empty and rinse with water and/or soap. As menstrual cups continue to increase in popularity more brands are regularly appearing on the market. 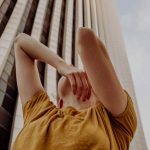 Since deciding on the best menstrual cup for your body might feel a bit overwhelming, some companies offer a money-back guarantee, even if you’ve already tried the cup. Cup selection is based on variables such as whether you’ve given birth, your flow, and whether you prefer a harder or softer silicone. Ultimately, the best menstrual cup for you is a highly individual decision and will be based on your individual body shape, size, and personal preferences. Boiling for five minutes in a kettle (or microwave). Swirling your cup in a solution of 1 part vinegar to 9 parts water for 2-3 minutes. Dissolve a denture pill in a 10 oz glass of warm water and let your cup sit for half an hour. Avoid using oil-based soap, hydrogen peroxide, bleach, any type of oil, rubbing alcohol, antibacterial soap, or hand sanitizer when cleaning your menstrual cup.